On March 23rd disabled asylum seekers officially claimed a space for their messages to be heard in the heart of Bristol. A painted mural composed of the drawings, ideas and messages of disabled asylum seekers was installed in the so-called Bear Pit, the multi-road roundabout at the heart of the city, close to the famously cosmopolitan Stokes Croft district. 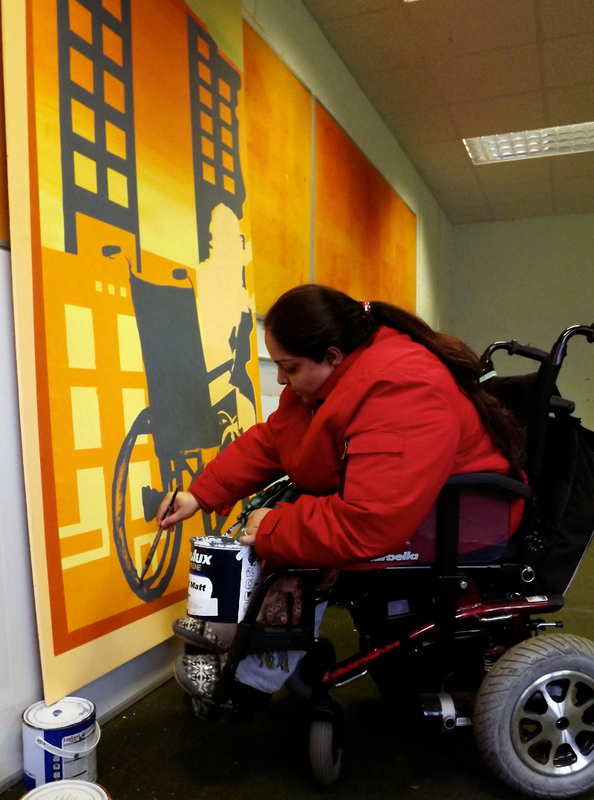 People who are rarely heard by anyone, not the disability movement, not the refugee community and not the government, are using art to claim a voice and a public space. Many people talked about seeing those who have houses or who sit in a café drinking tea and wondering why such a life is not available to everyone. When people take NASS (National Asylum Support Service) accommodation they know that they may be moved anywhere in the country that NASS chooses; they know that the police could come at any time to deport them. The stress and isolation of this is intolerable to many people. The woman in the picture who is jumping out of her flat would rather die than risk being deported. She has turned down NASS accommodation, which also means turning down financial support. Only those people who, after many years, have got immigration status, are allowed to work. But with no British qualifications, the only options are often manual work. For many disabled people this is not an option. In the picture two people work in the grounds of the big house, while those on the other side of the fence look on. 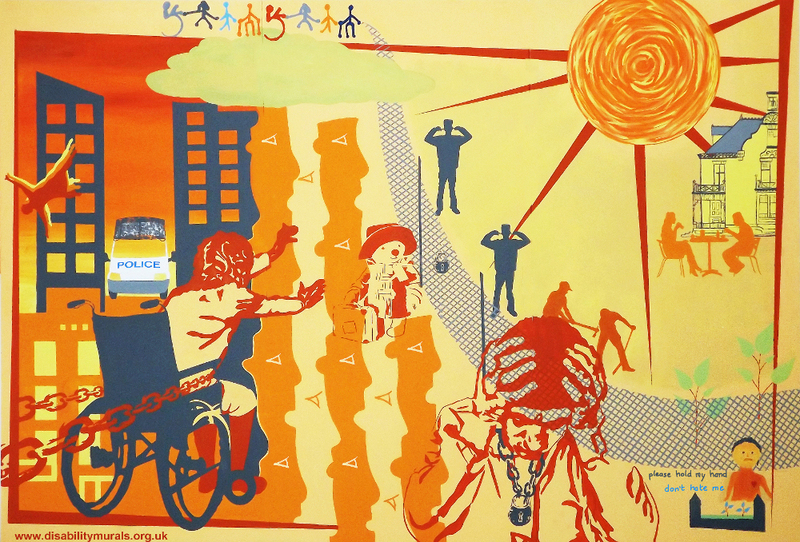 In this video, 'I'm an asylum seeker, it changes everything', disabled asylum seekers use the mural to describe the challenges they face. This was the most difficult work to get started. We could not find a Disabled Peoples Organisation that was aware of members who are asylum seekers or refugees. We got some advice from refugee community organisations regarding disabled people using their services but the information was ad hoc and word of mouth. More than one person did not want to be involved saying they did not want others to know that they were disabled. Only one person that did get involved was aware of the existence of the disability movement. The lack of information on the groups or services that might be available. 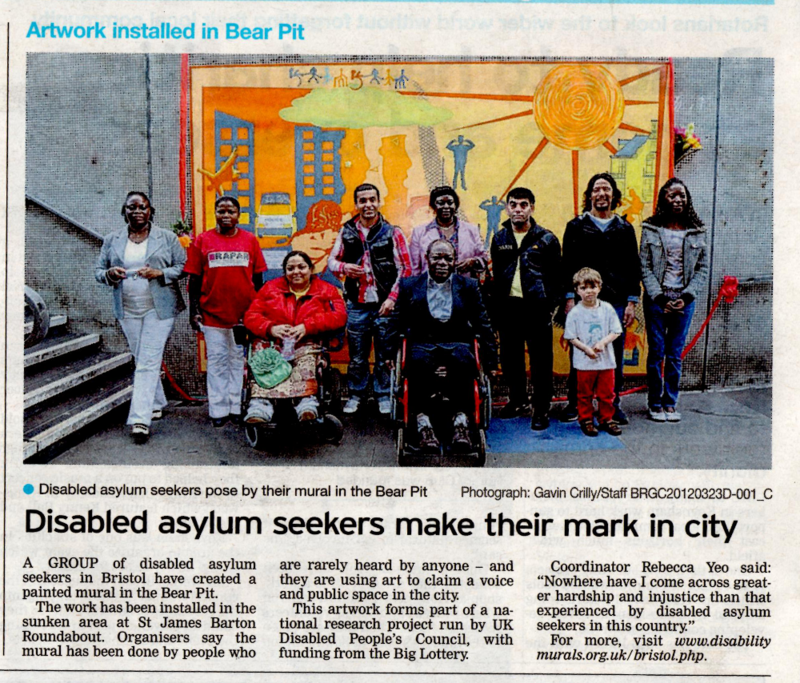 We can safely assume that there are many more disabled asylum seekers in Bristol than took part in this project. But because of the difficulties finding people locally, and because of the importance of building networks and solidarity we included people from Manchester and London. 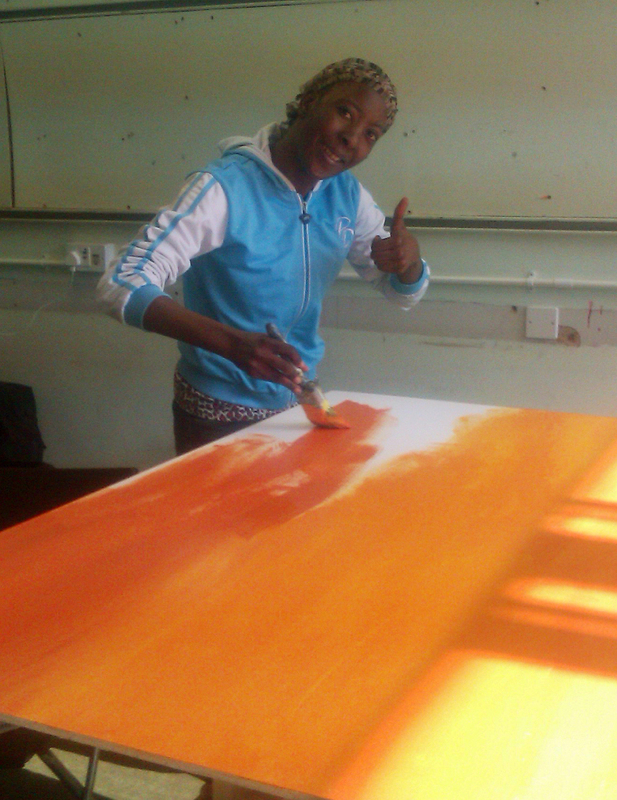 Putting the finishing touches to the mural once it has been installed. The opening event was addressed by all the participants as well as Fr Richard chair of Bristol City of Sanctuary, Laura Welti of Bristol Disability Equality Forum, Andy Rickell of the Vassall Centre Trust and Stephen Williams MP. Here is a video of the making of the Bristol mural, and the opening event. Unfortunately the audience was small, perhaps this is indicative of the importance given to the needs of this group of people. 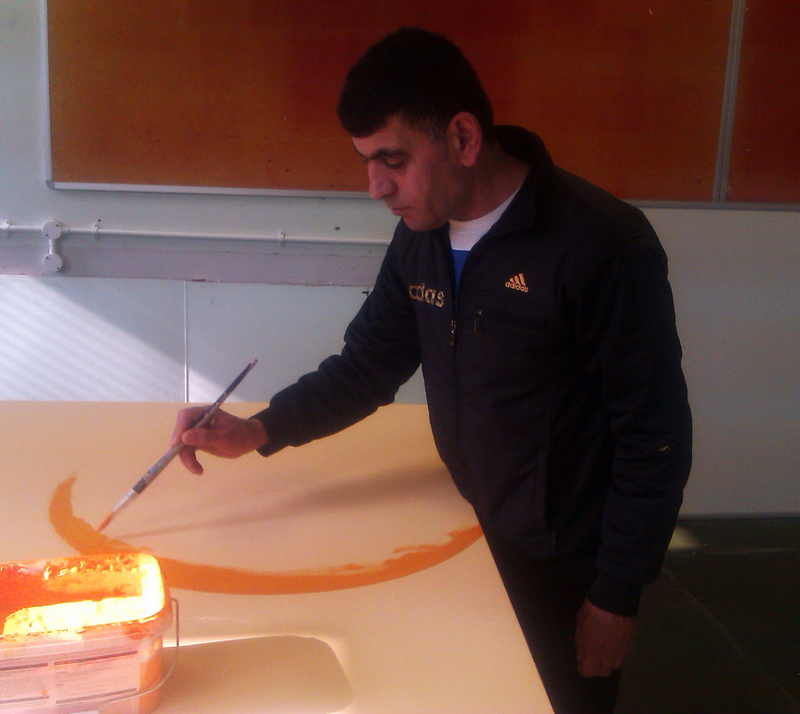 Ahmad cutting the ribbon to officially open the mural on 23rd March 2012. We all together trying to move forward to a better life for all disabled. I'm happy right now. Well done all our team. With our team we are going to be strong. Thank you it was so good. Can we do more. We had really good time. Its hard to find fitting words to express our feelings of gratitude. We appreciate people taking time to listen to the concerns of most neglected people. What a great event it was in Bristol! 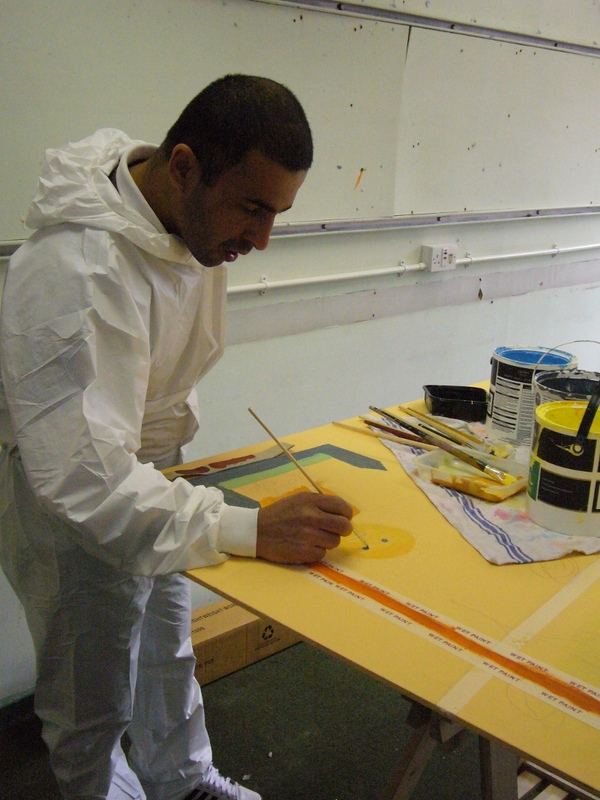 We will find somewhere to put the mural in Manchester too. Thank you so much. It was so good what we did together. All of us disabled people. We will never forget. We can't ever forget because we have proof, there it is what we did. It is so good. We won't forget. Words cannot express my feelings. It blows your thoughts and feelings away. It will keep me thinking for ages. I'd just like to pass a message on to the team that created the Bristol Mural. I think it's a really significant and emotive piece of art work, apart from which it's fabulously painted and looks amazing! I wish I'd known about the opening I'd really have loved to go to it. 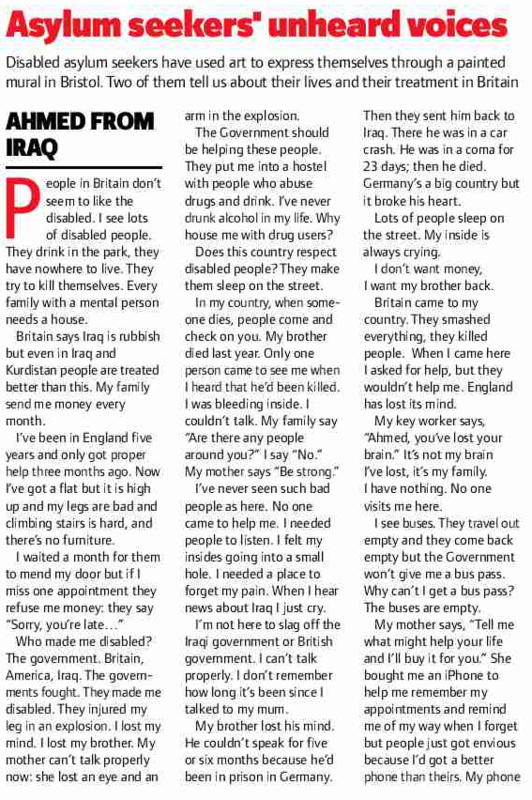 I didn't realise it was about disabled asylum seekers at first. Actually it's about much more than that. That fence is there for most of us, just to different degrees. I can identify with all the different characters on there. It brightens the area. Gives people something to think about when they come by. Makes me appreciate and feel sad about the place I live at the same time. Great that the artwork is there but terrible that people live like this. It is good to see Paddington bear on there. Paddington was a migrant and people looked after him, made sure he was ok. We need to make sure other people are ok too. From Platforma: an online article about the mural. "One person living in Bristol, with no income, no fixed abode, and severe mental health difficulties, explained, 'I am given medicine for my mental problems. The doctor says take tablets with food. I have no food. 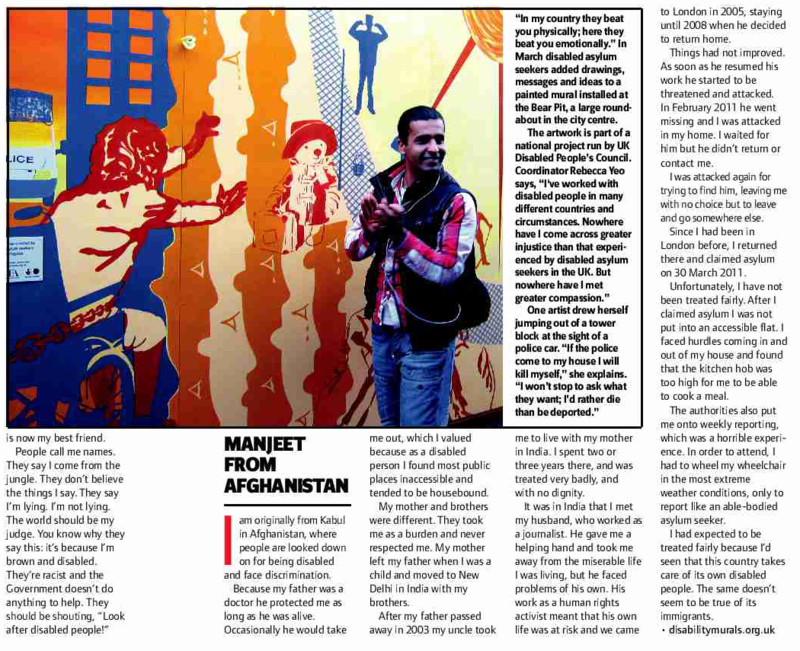 I left Iraq to find safety. But here I starve... I drew a picture of a sun hidden by a cloud. For me there is no sun'."